THE TUNDRA TABLOIDS CONFRONTS AVI SHLAIM ABOUT HIS HUMANITARIAN RACISM……. – The Tundra Tabloids……. THE TUNDRA TABLOIDS CONFRONTS AVI SHLAIM ABOUT HIS HUMANITARIAN RACISM……. 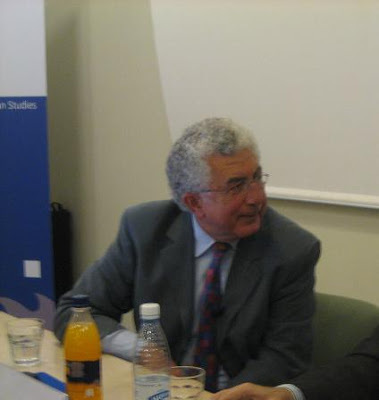 The Tundra Tabloids confronts the Oxford historian Avi Shlaim in the following video where he gave a lecture on Israeli history on Monday at the University of Helsinki. Prof. Shlaim belongs to the group of “New Historians”, who are harsh revisionist critics of modern Israeli history, and place all of the blame on the Jewish state. Their refusal to hold the Arabs to account stems from a false sense of sympathy which is deeply rooted in the racist notion that, they (the Arabs) are inherently incapable of adhering to the same morals and principles of law as the rest of us, so why bother. Their (The New Historians) refusal to hold the Arabs to the same set of moral standards expected from everyone else in the developed world, implies an acceptable form of inferiority. This is what the Tundra Tabloids was addressing. Previous Post Previous Post SUDANESE SCHOLAR SLAMS SHLAIM FOR SHODDY SCHOLARSHIP……! Next Post Next Post EU COMMISSION’S PUPPET PRESIDENT ROMPUY’S FIRST STATE VISIT IS TO FINLAND…….